NEW YORK / TORONTO -- Three of Canada's top musical acts - Hedley, Down With Webster and Hey Rosetta! -- have joined the line-up for NHL Face-Off™, the Oct. 7 opening day hockey and entertainment festival at Dundas Square in downtown Toronto, the National Hockey League (NHL) announced today. Fans will be able to take part in the 2010-11 NHL® season opening celebration at Dundas Square and enjoy the free performances and a host of other activities, starting at noon. Hedley is currently in the midst of their second, sold-out Canadian national arena tour. The Vancouver-based group - lead singer Jacob Hoggard, bassist Tom McDonald, guitarist Dave Rosin and drummer Chris Crippin -- is riding high on the success of their current album, The Show Must Go. Released in Canada in November 2009 - and coming soon on Island Def Jam in the U.S. - the album has produced a trio of Top 5 singles, including "Perfect," "Don't Talk to Strangers" and "Cha Ching," which they performed in the Closing Ceremony of the 2010 Winter Olympics. The band recently scored three wins at the 2010 MuchMusic Video Awards, including Video of the Year ("Perfect") and Pop Video of the Year ("Cha-Ching"). The band also recently had a record-breaking tenth #1 video on MuchMusic. 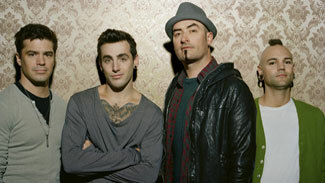 Since their self-titled debut in 2005 with Universal Canada, Hedley has received 11 Juno Award nominations. Their first album went double-platinum, producing the chart-topping single, "On My Own" and other hits "Gunnin," "3-2-1" and "Trip." Their second album, Famous Last Words (Universal Music Canada) released in 2007, also went double platinum with Top 5 hits "For the Nights I Can't Remember," "Never Too Late" and "Old School" and garnered five MuchMusic Video Awards at the 2008 ceremony. Hedley will be hitting the road in the U.S. starting Oct. 4. For tour dates and more details, visit www.hedleyonline.com. Described as a seven-member, genre-bending, musical juggernaut, Down With Webster (DWW) draws on disparate influences to create a wholly original musical feast. Grammy Award-winning producer and rapper Timbaland calls DWW "the most amazing, creative and innovative band that will come out in 2010. They're the illest group I've ever seen live." A relentless touring band, DWW has built a fanatical following with nearly every DWW show sold out. Down With Webster begins a six-week North American tour with 3Oh!3 in mid-October. DWW's Universal Motown debut, the mini-album, Time To Win, vol. I was released in October 2009. The album has already spawned three Canadian hit singles and music videos -- platinum-selling "Rich Girl$," which peaked at #9 on the Canadian charts, Top 40 in the U.S. and #1 on MuchMusic; platinum-selling "Your Man" which reached #7 on the charts and #1 on MuchMusic; and the latest single, "Whoa Is Me," which has just cracked the Top 20 and is rocketing up the chart -- and garnered industry accolades, including the band's first Juno Award nomination for Best New Group and two MuchMusic Video Award nods. The follow-up mini-album, Time To Win, vol. II, will be released in early 2011. For the latest news on DWW, visit www.facebook.com/downwithwebster. In only five years, Hey Rosetta! has received numerous honors - including three East Coast Music Awards in 2009, the Canadian Music Week's Indie Award for Best Album in 2009, XM Canada's 2008 Verge Award for Best Album -- and was a finalist for the 2009 Polaris Music Prize, all for the 2008 album, Into Your Lungs (and around in your heart and on through your blood). In 2009, the band released a 7" single and digital EP entitled Red Songs. They recently completed work on a third full-length album to be released early 2011. For more about Hey Rosetta!, visit www.heyrosetta.com. NHL Face-Off is the NHL's annual season-opening event. This year, the celebration comes to Dundas Square in downtown Toronto on Oct. 7. From noon until the conclusion of the Montreal Canadiens vs. Toronto Maple Leafs game at Air Canada Centre, the NHL® will treat fans at Dundas Square in Toronto to live musical performances; interactive attractions that test hockey skills; prizing and giveaways, including a trip to the 2011 NHL Heritage Classic™; special guest appearances, including former NHL players; food, beverage and merchandise tents; and live CBC and VERSUS game broadcasts on giant screens, including the Dundas Square video boards. CBC's Hockey Night in Canada, VERSUS and the NHL Network™ will broadcast live from the event throughout the day, including portions of CBC's pre-game show, Scotiabank Hockey Tonight, beginning nationally at 6:30 p.m. ET.